US Secretary of State Mike Pompeo urged European countries on Thursday to support American plans to cut Iran regime off from world energy markets, AFP reports. 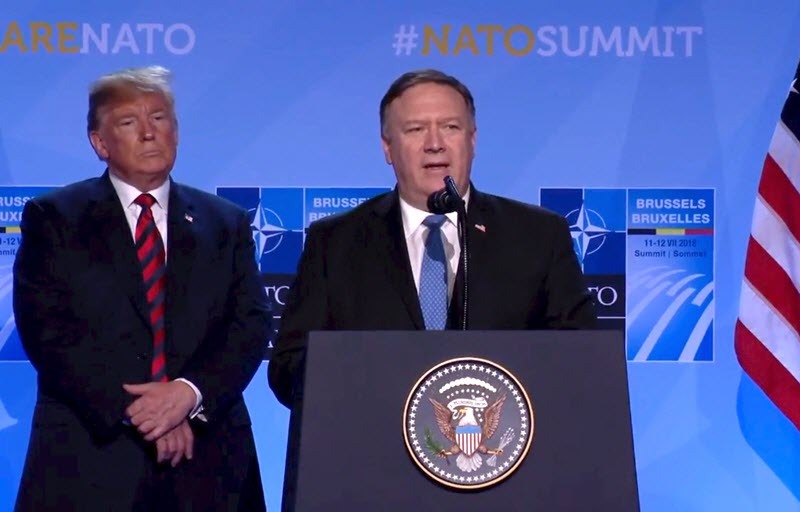 These comments came during talks in Brussels at the EU-US energy council, on the sidelines of the NATO summit, with Energy Secretary Rick Perry, Saudi foreign minister Adel Al Jubeir, Iraqi PM Haider Al Abadi, and EU foreign policy chief Federica Mogherini in attendance. At these meetings, Pompeo committed to increasing US-Saudi cooperation to “address the full array of threats posed by Iran” and have the Gulf partners “work together to promote regional security and stability, and stand against Iran’s destabilising activities”. This includes Iran's support of the terrorist Houthis in Yemen, use of ballistic missiles in spite of a UN resolution, support for Syrian dictator Bashar Assad and his use of chemical weapons, interference in the Iraqi elections, and the latest terror plot by Iran targeting the Iranian Resistance in Paris. While Pompeo made no official statement before going into the talks tweeted: "Iran continues to send weapons across the Middle East, in blatant violation of UN Security Council resolutions. Iran's regime wants to start trouble wherever it can. It's our responsibility to stop it." He also attached a picture of a map of Europe, which showed the location of 11 terror attacks that were carried out by the Iranian regime or its Hezbollah proxy since 1979. Trump pulled out of the Iran nuclear deal in May, citing the Iranian regime’s flagrant violations, which sparked the reinstatement of harsh sanctions against regime in Teharn, particularly its oil industry, which accounts for so much of the country’s revenue. Since then, Trump has warned countries to stop buying Iranian oil by November 4 or face sanctions themselves. The other signatories to the nuclear deal, including France, Germany, and the UK, are trying to save the deal, but there is no proof that they can protect their companies or even themselves against the sanctions.